In the magic phase I used my Binding scroll on the Spectral Blades, since it was the only way that the cadaver wagon would be able to punch through the Prince’s defenses. I let through a couple more raises, which offset whatever losses the big block had suffered by marching through the sylvan forest and healed the varkolak, then I dispelled the Danse Macabre. 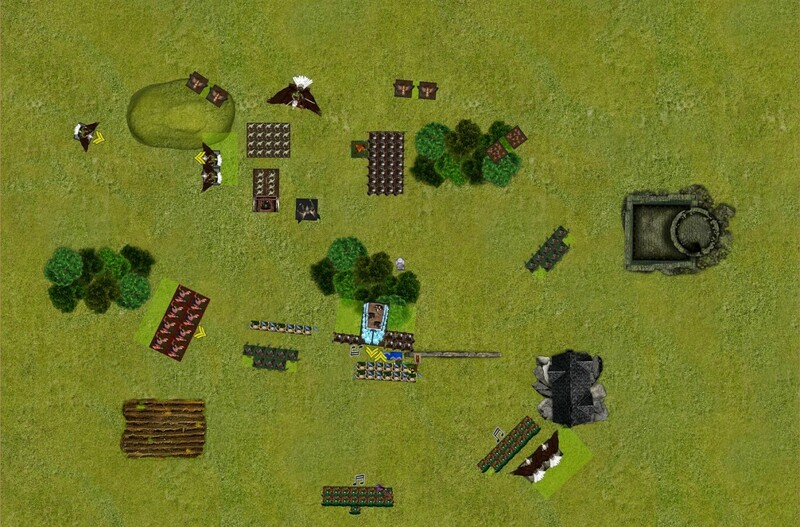 In the only combat of the round, the Cadaver Wagon’s saves were hot: the prince and eagleonly managed to deal two wounds on the thing, and thanks to its necromantic aura it didn’t crumble at all. With the Prince in deep trouble, the eagles had to come to the rescue! 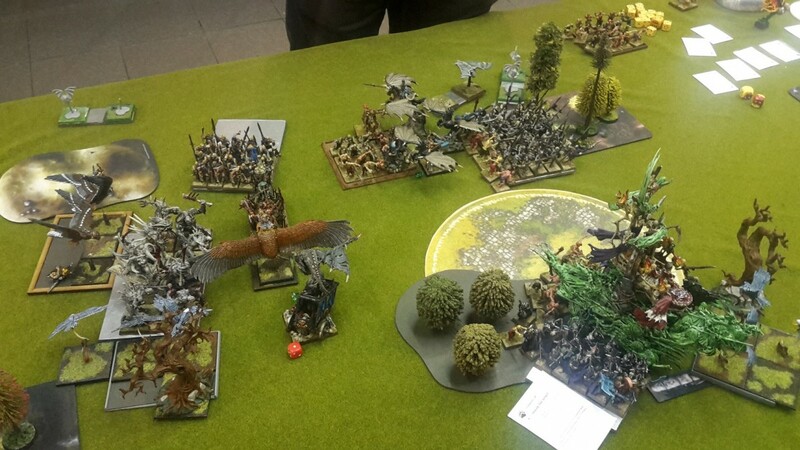 The leftmost kestrels and the Forest Eagles combo-charged the Ghasts: while they had no hopes of actually killing the beasts in one go, engaging them on a flank and the rear meant that I’d be able to keep them pinned for a while, giving my Prince the chance to get away. 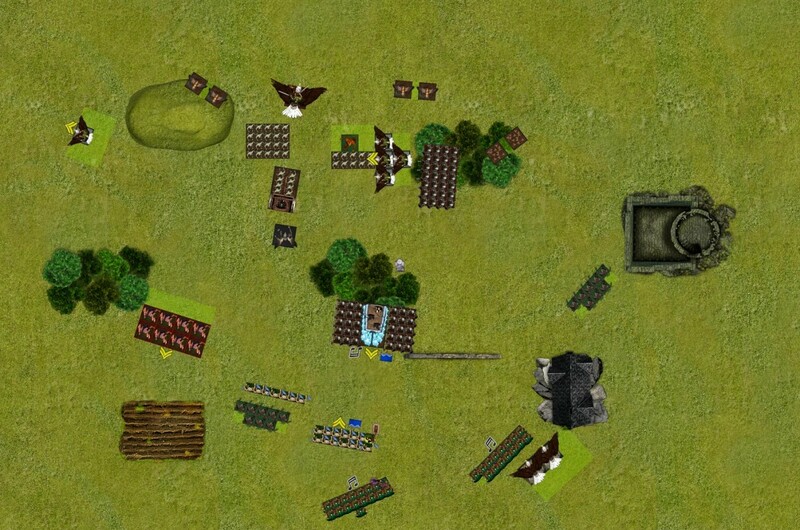 Meanwhile, the second kestrel unit saw an opening: the gap between the zombie bunker and the spear skeletons was large enough to allow them to land, so they managed to flank charge the necromancer bunker. The Totemic beast also charged the bunker’s rear, ensuring that the zombies would go down quickly. The second eagle unit redirected the big halberd block, and the rest of the army shuffle daround a bit. Now my fast units were all committed, so I had to hope it would go according to the plan! In magic I was too far away from the combats to try and boost the chargers, so I settled for yet another Insect Swarm on the Varkolak, which got dispelled. Then I cast Break the Spirit on the big unit, which my opponent had to let through. Shooting succeeded in dropping the Varkolak to one wound once more. The combat phase was eventful, to say the least: The Prince tried to kill off the Cadaver Wagon, but yet again the regeneration saves thwarted his attempts! He only dealt one wound, leaving the wagon on one wound remaining and getting stuck for another turn. The Ghasts were next, and thanks to their 4++ regeneration they managed to avoid the worst of the kestrels’ attacks, and dealt enough damage to draw the combat. At least they were pinned for a round, buying my prince precious time. Finally, the charging kestrels to the right didn’t fail me: they managed to kill the Master Necromancer in one go, and with him a bunch of zombies. The unit crumbled a bit but fought on, but at least now the Vampire magic phase was a lot more manageable! 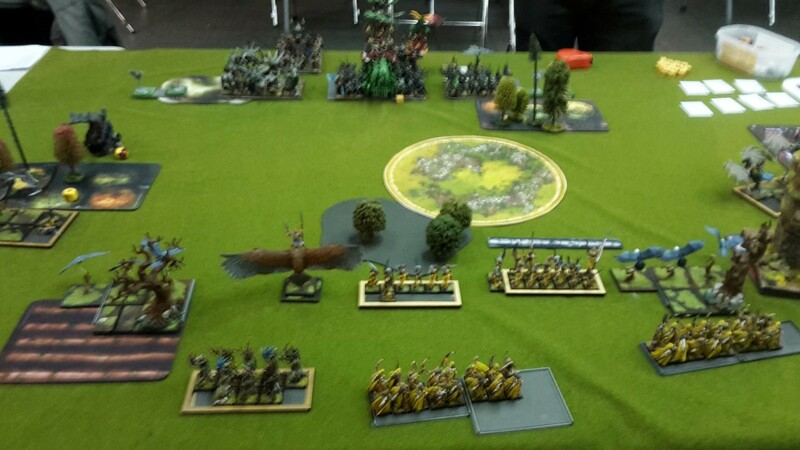 The varkolak rear-charged my Eagle Prince, while the vampire’s skeleton block braved the Dangerous Terrain checks and charged the eagles right in front of them. 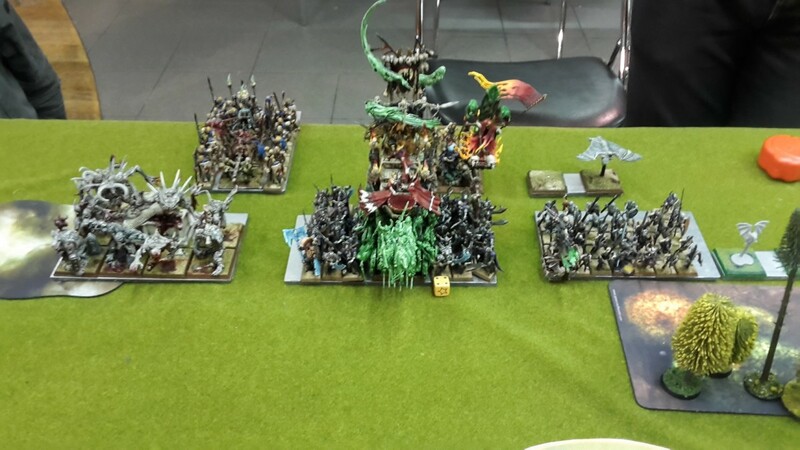 Around 20 of the skeletons died to the DTs, but the vampire was unscathed. The bats flew around, with no real redirection targets available, and the spear skeletons reformed to look at the right kestrels’ rear. 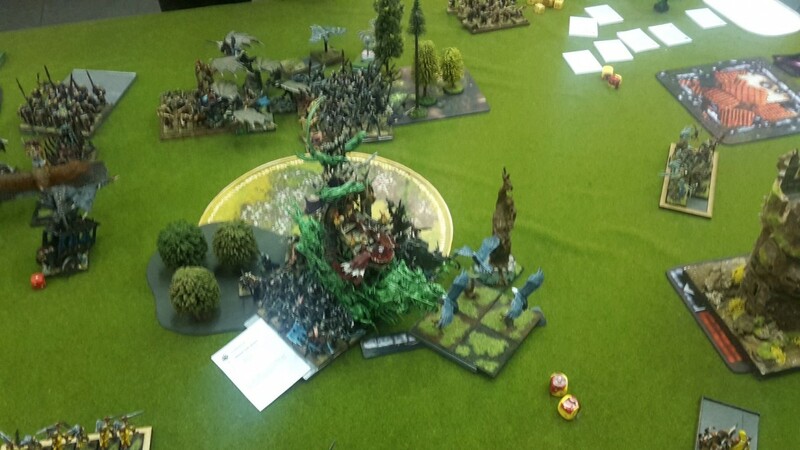 In the magic phase my opponent tried to force a 12” aura casting of the Arise spell through, hoping to heal both the Varkolak and the Cadaver Wagon. The 5-dice attempt resulted in triple sixes, and saw the second Necromancer blow up! This meant that the undead units were healed considerably, but at least it would get even easier to handle the magic phase from now on. 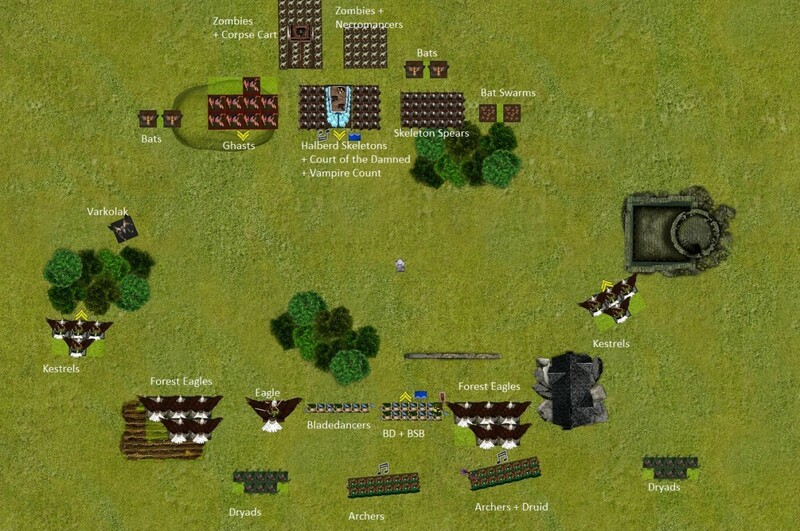 The charging vampire retinue did 10 wounds on the eagles, who failed to do much back and ran, flying past my sylvan archers, where they would rally on the following turn. Fearing another deadly round of dangerous terrain checks, the skeletons held their ground. The Zombie/Kestrel fight raged on, with only a handful of zombies surviving after crumble, pinning my flyers in place. 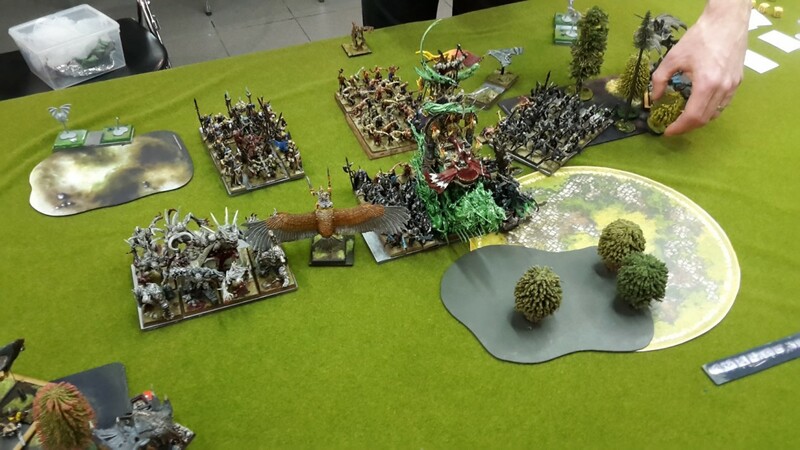 The Forest Prince tried to kill the charging Varkolak, but once more 4++ regeneration proved to be too much; only one wound went through, and in retaliation the beast put two wounds on my prince. My general broke from combat and ran, thankfully outrunning the Varkolak and passing his dangerous terrain checks. 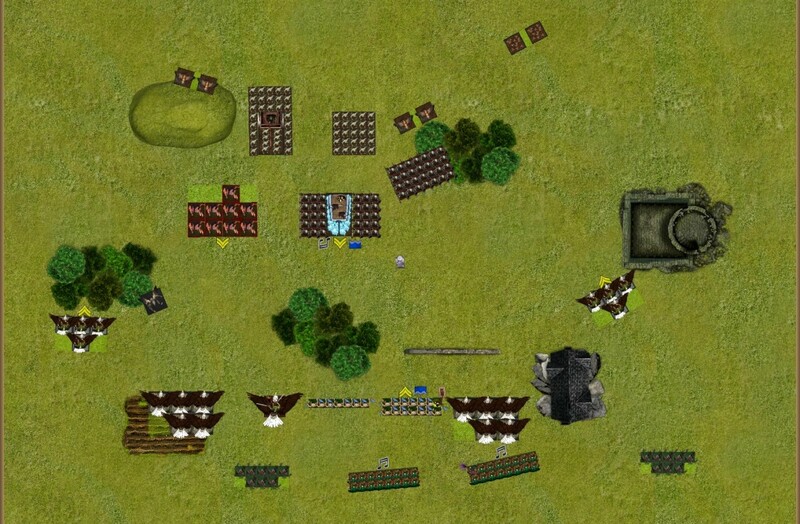 Finally, the Ghasts – bolstered by rerolls to hit- were able to deal considerable damage to both the kestrels and the forest eagles, forcing both units to flee. They failed their Discipline check to restrain pursuit, and were forced to pursue the eagles, running them down. At least, that meant that they’d be out of action for at least a couple of turns more! 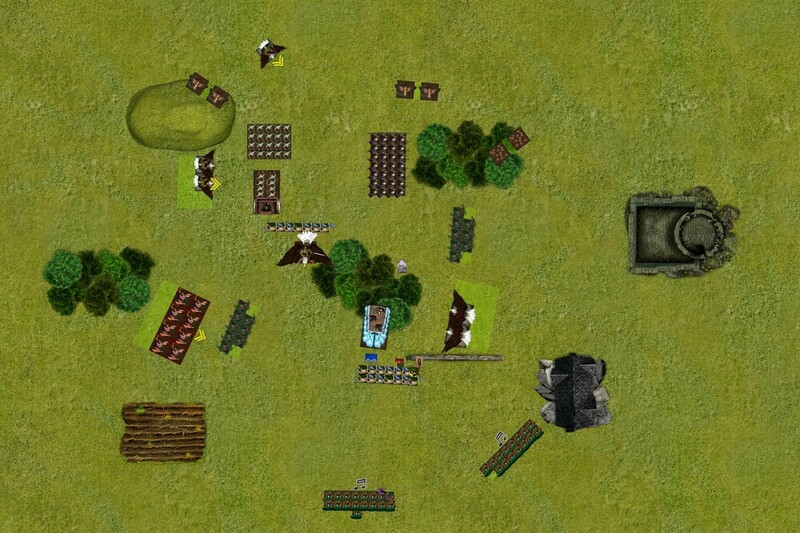 The Elven momentum had been halted now, with one kestrel unit fleeing and another stuck fighting the zombies. 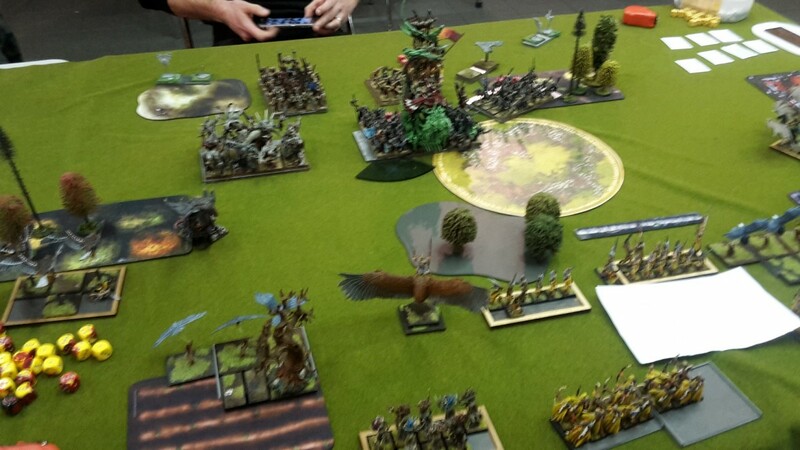 The rightmost dryads attempted a long charge into the spear skeletons’ rear, in an attempt to save the kestrels, but failed. 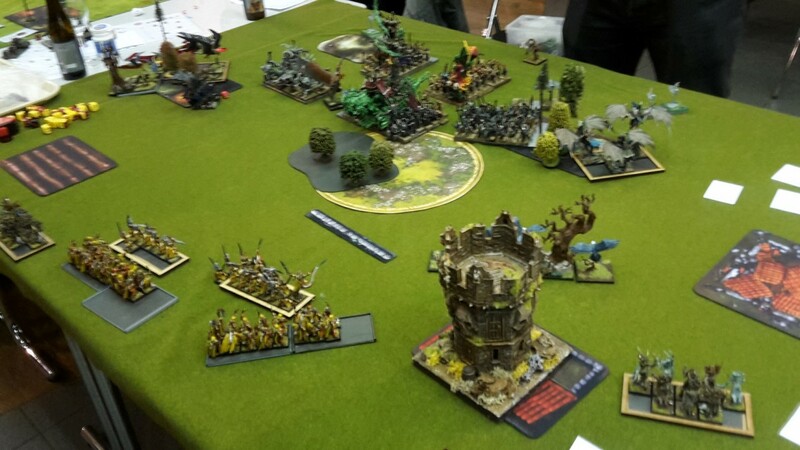 The second dryad unit positioned itself so as to start contesting the objective from the following turn. All of my fleeing units rallied, ready to have another go at the vampires. The small bladedancer unit failed a short charge against the rear of the Varkolak, and the bigger unit stepped in front of the vampire’s skeletons, tempting them to charge. In magic the Insect swarm was yet again dispelled, then Break the Spirit was once more cast on the halberd skeletons. 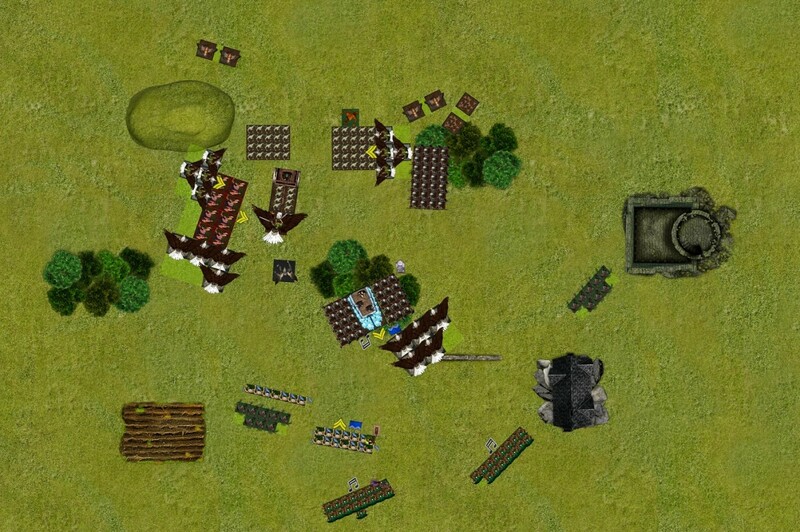 The archers, having moved within short range of said block, let loose and no less than 20 skeletons fell to their arrows! 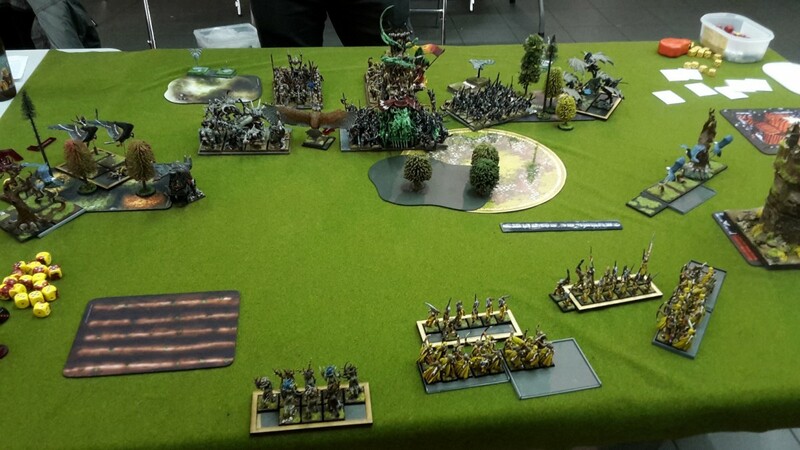 In combat the kestrels failed to dispatch the last zombie and would have to take the skeleton spears’ charge next turn. With only 30 minutes remaining, we agreed that this would be the last turn of the game. The Vampire Count charged out of his unit and into the Bladedancers, suffering a wound on the way in from DT. The Skeletons fell into the kestrels and the rest of the army maneuvered a bit. Magic -what was left of it- was shut down, and we went straight to combat. The Vampire Count challenged, and the unit champion took it, using his 3++ aegis save to evade all of the vampire’s attacks. The vampire took a wound from combat resolution, and the challenge went on. The charging spears killed a couple of Kestrels, took minimal damage back and broke my flyers, who fled to safety. The skeletons pursued into the totemic summon. With the objective lost (two tokens vs only one), my goal was to get as many points as possible. The small bladedancers and the prince tag-teamed the Varkolak, and the archers moved into position to shoot the remaining skeleton halberdiers some more. Magic saw me cast the Beast Awakens on the Bladedancers, Break the Spirit was dispelled and then the Forest Embrace got double 1’s and failed to cast. Shooting was as effective as in the previous turn, managing to kill off the entire skeleton halberd unit! 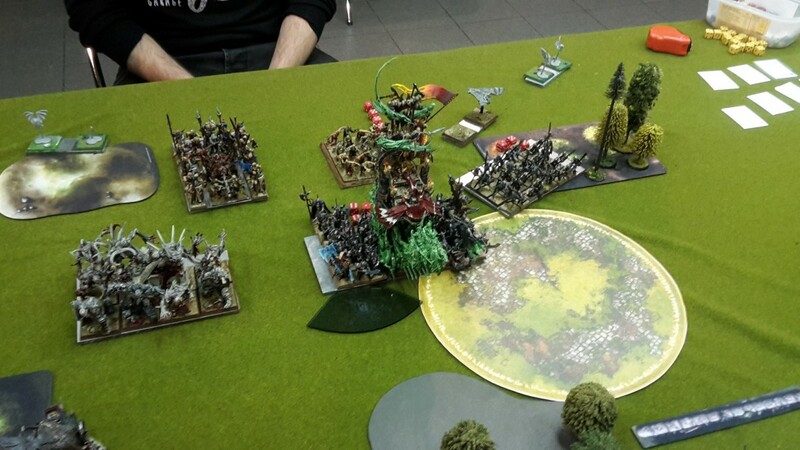 In the closing combats of the game, the Prince finally managed to kill the varkolak, overrunning to safety, while the vampire count killed the enemy champion, getting enough combat resolution to avoid crumbling. The spear skeletons killed off the totemic summon, bringing the game to a close. 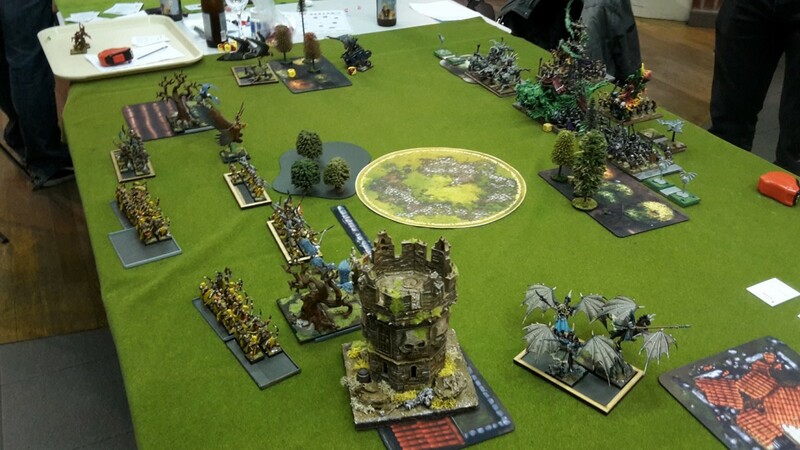 The sylvan shad managed to deal a lot of damage to the vampires, but in return had lost the Hold the Ground objective: this meant that the game ended in a 10-10 draw! I’m relatively satisfied with how the game went, especially factoring in the fact that had we played 6 turns I would have been able to at least deny the objective if not claim it, and that playing against vampires without magic with a force that can deal so much damage in combat would mean I’d get a comfortable win. This time the delay was mostly my opponent’s doing than mine, but once more it was not intended: trying to figure out how many skeletons took 1,2 or 3 DT checks was time-consuming, as was resolving all of the raise spells! The key moments of the game were of course the turn 1 and 2 maneuvers, showcasing how having so many flying threats can help overcome the odds against a list that brings sturdy blocks that can grind. Getting rid of the casters was essentialto winning the game, as you cannot risk going in a grind against 60 skeletons with 4 raise spells and channel (5). 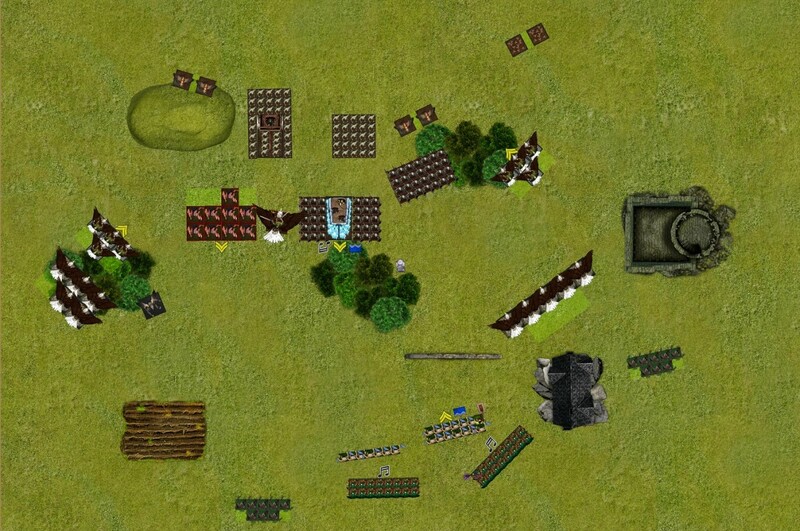 My opponent made things a bit easier by leaving a 3.2” gap for my kestrels to land on turn 2, but the result would have probably been the same if the kestrels had only managed to clip: once the zombies were engaged on two sides, they were going to die before the rest of the undead forces could come to their rescue. The rest of the team once more performed great, all of them winning their games by a good margin, resulting in a third big win for the team! So next up we would be facing a team from Paris, sporting very experienced ETC players from team France and team UN. Stay tuned for round 4! Great Battle Report. I look forward to reading more.